Today, one of the most efficient ways to reduce one's ecological footprint is to reduce the amount of flying, or stop flying altogether. For many people this seems like an impossible solution since their professions require constant traveling. The seminar will feature examples of concrete tools to tackle this issue, and reflections of why in the era of communication technologies it is still necessary to be flying people around for face-to-face meetings? John Thackara is renowned internationally for his work as director of the design innovation network, Doors of Perception. Doors creates projects and festivals in which designers, together with grassroots innovators and other citizens, develop new services and products for daily life. This unique network of paradigm-changing designers and grassroots innovators is inspired by two questions: 'what might life in a sustainable world be like? '; and, 'what design steps are needed to get us there?'. John has lectured in more than 40 countries and is the author of 12 books; his latest is In the bubble: designing in a complex world (MIT Press 2005). 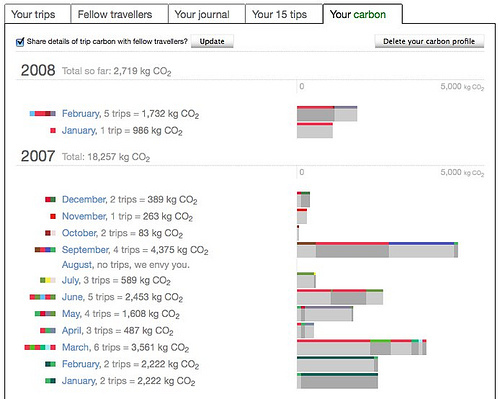 Carbon Hero uses existing technologies in a novel and innovative way, without compromising the individual’s privacy, to reveal to its user their own unique Travel Carbon Footprint. It essentially identifies and evaluates the different forms of transport used as one goes about ones business getting from A to B, and then outputs this to the user. The accompanying software has been written in Java to run on pretty much every mobile. Daniel Peltz (Initiator of RISD.tv) is speaking - remote participation.